Sometimes you need to shoot where a flash will not be allowed. As a parent of young children, this is normally the yearly dance show or prize giving in the school hall. Hopefully these tips will help you shoot something. In these conditions, the traditional point-and-shoot cameras will not work. You are looking for a camera that will give you some control and has at least an ISO1600 or higher. You want to keep the camera in manual and ensure the flash stays down. Most modern DSLR's with build-in flash, has this automatic pop-up feature of the flash when in Automatic mode. That pop-up and flash could get you chucked out of the show and then you are going to be in trouble with the whole family, not even mentioning the studio! In manual you can control the settings. Ensure you have the ISO at MAX, the exposure time around 1/60 at the longest and the F open all the way. Now the camera review will most probably not show anything as the photo will be to dark. 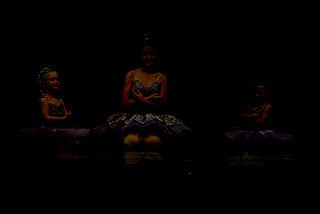 These examples are from my sisters yearly studio show ( Nelie Vorster School of Dance ) with a Canon D300 using max ISO1600 with a 200mm lens and no flash. I fixed the exposure time to 1/60 and left the F wide open. The "taken photo" is what was shown on the review LCD on the camera, and what I saw on the PC after transferring the photos. As you can see, it looks like nothing. It however does contain an image. The quickest way to get all the photos processed I found, was Google Picasa. They support an effects copy and paste feature that makes applying the same fix to a bunch of photos quick and easy. I applied the "Auto Contrast" and lifted the "Fill Light" with 50%. I also had to apply white balance correction as the Canon had picked different white balance for just about every shot. This was also done quickly in Picasa with the build in "Neutral Color Picker" tool. There however is one problem with this technique, and it is noise. The higher the ISO, the more noise is introduced into the photo. My quick explanation is as you increase the ISO level, the camera combines more "pixels" to then get enough light to get what it is looking at, so the picture gets "pixelated". The same technique works very well when shooting your daughters prize giving in the school hall. Here the problem is you are to far away from your child to use that little build in flash. Use the same technique and settings and at least you can share the pride of the moment with the family. Please do test this with your own camera and settings before trying this. Also ensure that the event says "no flash photography" as appose to "no photography".